Toshiba has been showing off a number of new products over at the IFA show in Berlin, including new laptops (as well as refreshed existing models), alongside some new storage solutions. The star of Toshiba's laptop line-up is the new convertible Satellite Radius 12, a 12.5-inch model with a 4K (3,840 x 2,160 resolution) display powered by Intel's new Skylake processors. The Satellite Radius 12 offers five different modes of operation (laptop, tablet, tabletop, presentation and audience modes). It can be configured with up to a Core i7 CPU and storage options running up to a 512GB SSD – check out further details of this hybrid in our story here. Toshiba also unveiled the bigger Satellite Radius 14, an all-round 5-in-1 convertible along the same lines, and also offering Skylake CPUs (or optionally AMD A8 APUs if you prefer). It has a 14-inch screen with a resolution of 1366 x 768, and can be decked out with up to 16GB of RAM, and up to 2TB in terms of a hard disk, or a 256GB SSD. Harman Kardon stereo speakers are on board with DTS sound enhancement, too. 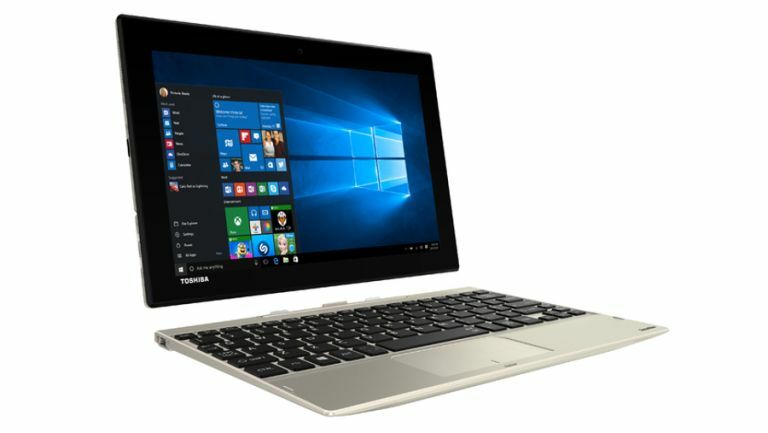 A battery life of up to 10 hours is promised by Toshiba, and of course both these machines run Windows 10, meaning Continuum should ensure a smooth transition between tablet and laptop usage. The other new laptop is the Satellite Click 10 (pictured above), a hybrid that features a detachable 10.1-inch display (with a resolution of 1920 x 1200) which can be used as a tablet, and then simply clicked back into the keyboard for when you need a notebook again. This device is powered by a new Intel Atom processor paired with 4GB of RAM, and offers up to 64GB of flash storage (with a microSDTM card slot for potential expansion of up to 128GB). The Click 10 also runs Windows 10, and offers a battery life of up to 15 hours in laptop mode, or 8 hours when you're using the tablet detached from the base. Furthermore, Toshiba has refreshed some of its existing laptops. These include moves such as giving the Satellite P50t-C/P50-C models Skylake processors to pep up their performance, and the Satellite Radius 11 has been redesigned with sleek new lines and the latest Intel Celeron and Pentium processors are now available for the machine. Finally, Toshiba also revealed some innovations on the storage front, which include the introduction of the new X300 High-Performance Desktop Hard Drive, a 3.5-inch hard disk which is designed to be able to cope with demanding apps such as high-end games with lavish visuals. The company unveiled a new 2.5-inch solid state hybrid drive along similar lines, the H200 High-Performance Hybrid Drive, which mixes a traditional spinning drive with some flash storage and will certainly be of interest to laptop gamers. Also check out this review: Toshiba Satellite Radius 15 (2015): the best convertible yet?